Happy swimmers in the Ceramic Gulf (or Gulf of Keramos), south of Bodrum on Turkey’s Aegean Coast. Swimming is good for you – we all know that. It is an easy and usually a very pleasant way to exercise, to use all of your limbs and nearly all of your muscles, and to do so in a way that is as strenuous or as easy-going as you wish. Among the many joys available on a gulet cruise, it is one of the most important. Virtually all our guests enjoy swimming, whether they are avid and regular athletes or more comfort-loving, whether they are four years old or approaching ninety (or anywhere in between). Some enjoy a short dip and paddle, others aim for a more systematic approach, setting themselves times to fulfil or distances to cover, or even both. Some combine their swim with a bit of snorkelling, others add time on one of the kayaks our gulets normally provide, or on a paddle-board. Some guests, irrespective of whether they are travelling alone or in company, prefer swimming by themselves, others make it a joyous and garrulous group experience. On most of our cruises, there is ample time and opportunity for swimming, ranging from a short swimming break after breakfast or before dinner to long and leisurely hours reserved for it, sometimes entire mornings or afternoons, depending on the requirements of the itinerary with its expert-led archaeological and cultural visits and also – of course – on the weather. But on virtually every trip, swimming is a defining element to the cruise, and a much-appreciated one. Happy swimmers next to a gulet’s prow, just off the beautiful island of Korčula on Croatia’s Dalmatian Coast. Swimming is a popular activity for many reasons, the key one being that it is easy for virtually all of us. Probably, most of our guests have access to opportunities for swimming in their home environment: private or public pools, for the very lucky ones a local lake or seashore. 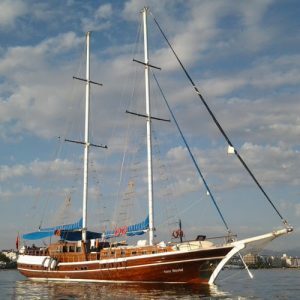 But on our gulet cruises, everything is so much easier: the gulet, when stationary in a cove, usually has a stairway leading straight into the sea in a few short steps, and various equipment, such as floating ‘noodles’, goggles, flippers etc, is ready at hand, as are towels for drying off. Going for a swim is an easy decision and the pleasures of the sea are just seconds away from one’s cabin. But most importantly, most alluringly, the swimming on offer is in the waters of the Mediterranean Sea. Where we stop, the water is clean and usually very clear, while being part of that incredibly large and connected body of water that covers 71 per cent of the planet’s surface. It’s been said (by Heraclitus, no less) that you can’t swim in the same river twice, because water flows and nothing is ever the same, and this applies even more for the sea: every time you step down the ship-side stair and lower yourself into the sea, or jump into it from further up (if you dare), you have this extraordinary experience of swift refreshment and easy buoyancy (the Mediterranean is very salty) and carefree adventure. Everywhere we swim, there is a vista of land and sea to behold, a world of beauty beckoning. No two swims are the same. Swimmers in a stunning cliff-girt cove on the Greek island of Symi in the Dodecanese. The water has its own rhythm, ranging from tiny ripples via rhythmic lapping to small waves (or rarely big ones, but usually we avoid those for swimming). 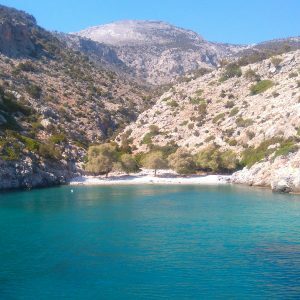 It also has its own range of colours, from a crisp and transparent clarity via the light greens and blues that dominate when we are swimming in shallow waters, not far above rocky or sandy sea-bottoms, all the way to the mesmerising blues of deep water. 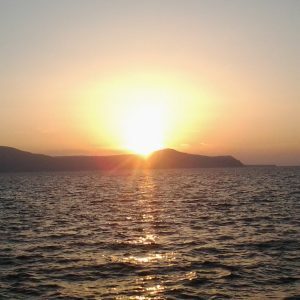 All of them are part of a continuum, of the immensity that is the sea, even a smallish sea like the Mediterranean, defining the mainlands and islands it surrounds, but also being defined by them. Sometimes, wearing goggles, our guests a-swimming find something to look at below the water. Often, it is just the play of light and wave-made shade on a sandy sea-bottom, a sight of endless beauty. The Mediterranean is not as rich in sea-life as other seas, but often, we encounter great schools of small fish, or bigger ones darting about, the sunlight sparkling on their sleek bodies. Very rarely, we see larger creatures, such as caretta caretta (the Loggerhead Sea Turtle), a solitary and reclusive creature that we should not disturb but that may choose to swim in the same waters with us and that is remarkably lacking in shyness when close to us. A rare sight, but a wonderful one: I took this picture of a caretta caretta while swimming off the gulet near Kaş on Turkey’s Lycian Shore, a few years ago. On a few occasions, we have seen archaeological material under water, usually in the form of pottery, be it the cargo of long-lost ships or the debris of long-abandoned harbours, or even structures like piers and moles belonging to the latter. In such cases, we relish the sight, but we avoid interfering with what we see: it is ours to enjoy beholding, but not ours to meddle with. In some places, our swimmers have an opportunity to explore above water, by approaching islets or reefs and following their outlines, following natural or man-made features below or above the water. Here and there, our guests walk or scramble ashore, to spend a little time basking on a sunlit beach, sandy or pebbly, to climb some rocks or cliffs, or to sit under a remote seaside tree (usually a tamarisk, but perhaps an olive), or to explore a remote cove frequented by fishermen and boatmen for centuries and millennia and find what they left behind: scatters of potsherds, foundations of walls, tiny chapels that are still occasionally attended and contain icons or oil lamps, inviting us to light a candle for those at sea. Pure joy on and off the boat – another shot from Croatia. It is a holistic experience. The way I usually approach it is by surveying the spot we’re anchored at in advance, identifying any spots or landmarks that might be of interest to me, or that might give me joy: a tiny bit of sandy beach, a flat-topped reef to sit or stand on, an apparently man-made structure ashore, ancient or recent (you rarely know before you reach it). The moment of entering the water is always new and always fresh and always exciting. A leisurely breaststroke is my chosen way, as I like seeing what’s above the water – and if there is nothing to see at all, I will circle the gulet itself, listening to the water and to the distant voices of my guests aboard or likewise in the water. It is a time of pure and unmitigated pleasure. Yours to enjoy! Our gulet at anchor off Filicudi in Italy’s Aeolian Islands. There really are no words to adequately describe the quiet joy of swimming in the Mediterranean, be it in one of the sheltered inlets on the Turkish Shores, among the rarer coves of the Greek Aegean islands, along the rock-girt coasts of Croatia’s Dalmatian islands and islets, in the deep blue waters around the volcanic islands of Lipari or in the historic seas of the Amalfi Coast. On every occasion, it is a chance for you, our guest, to literally immerse yourself in the local scenery and to make the experience your own, to share with your friends and loved ones or to create indelible memories for yourself. You can have a swim, alone or in company, nearly every day on most of our gulet cruises in four countries – and you deserve it.